Britt: As an actor who was only attempting to work, get a job, do a part, I would go on interviews. Sometimes the first interview was with a casting person, if he or she did not know your work. And that was before you got a chance to read for the director. I can't remember if I had to read for a casting director first for Weird Science. But if I did I must have passed because next I met with John Hughes and the casting director, producer, etc., not separately but all together in a room where I read my part - with the casting director reading the other parts. Sometimes it was a conference room and sometimes it was simply an office on the lot at Universal or some other studio. And with Weird Science I remember it being an office. Oddly enough, I can remember that John Hughes was sitting on a couch nearby, to my left in fact, and I was in a chair. As to the script, I might not have even seen an entire script before the audition. It's possible that I only saw what are called "sides" - just part of the script with your character's words and sometimes only part of the preceding line, your cues in other words. The more secretive directors would do that. God forbid that the entire opus would get out. I kind of doubt that was true with Weird Science, but I can't remember if I ever saw the entire Weird Science script before I got the part. As to what I attempted to do with that audition, I always tried for strong choices with all my auditions, as the character is going through whatever emotional changes he might be going through, in reading a line or reacting to another character. So that those gathered could get a good idea of how I would handle the specific part and acting in general. Lines change, directions change. Can this guy handle it? A director (and everyone else in the room) also likes to see confidence. They don't want an actor who will fold under the pressure of shooting a scene on a sound stage. Lights, crew, other actors, bad coffee. So the Weird Science audition was like any other audition, in that sense. And this character, "Al", was just one more husband dealing with his wife, one more dad dealing with his son and later one more dad dealing with a beautiful witch (Kelly LeBrock), who could just generally be thought of as one more physical threat, though a very beautiful physical threat, when she put the pistol in my face. Standard actor choices. Very easy to show fear with a pistol pointed at you or even an imaginary pistol pointing at you in the audition. Nothing special. Perhaps I could clarify the process this way. I was an actor trying to get a part, a job, pay the rent, eat. I wasn't auditioning for Weird Science knowing that it would become a hit for teenage boys everywhere for a long time or that I would be answering questions about it many years later. Just another job at the time. That thinking also applied after I got the job and was on the set. And, yes, even in the presence of Kelly LeBrock. Q: I am huge fan of all of the John Hughes films from the '80s. Did you get to know him at all during the making of the film? What can you tell us about John Hughes and your experience working for him (in Weird Science and also later in The Great Outdoors)? Britt: John was a very gentle, supportive director who let actors work. He was never in my face with suggestions. I do remember that when I was improvising some curse words of terror with that pistol in my face, he told me to go for more PG-rated words. But that's all I remember about his direction. He also asked me if I wanted to watch dailies with him, but I never watched dailies (raw footage from previous days' work) for any film I did. My work was already on film. If John or any other director wasn't satisfied with my work, having seen the dailies, he would re-shoot the scene. So what good was my seeing the dailies? If my choice to not see the dailies displeased him, he never showed it. John was a gentleman. And even though John wrote and produced The Great Outdoors, I never saw him during that film's production. Howard Deutch was the director. Q: You played the father of Anthony Michael Hall's character "Gary". What can you tell us about Hall and working with him? Britt: Anthony Michael Hall was just one more professional actor doing his work, making acting choices. I worked off of him and he worked off me. No hanging out off-set. I didn't like to hang out with actors off-camera. It could be confusing for the time I was on camera. I wanted to always see the actor as the character. I'm sure that other actors could hang out and then do the scene, but I couldn't. Hall was a good strong actor. I did really enjoy working with him. Q: You had a great scene with the beautiful Kelly LeBrock as well. What can you tell us about LeBrock and working with her? Britt: Sorry if this is a little repetitive and boring, but I always tried to think of the actor as the character. True with Kelly as well. Very professional actor who did the job. That kind of statement is true of 99% of all acting jobs during my years of acting and it would be my hope today. Actors have a job to do, and it's in front of the camera. I suppose that when an actor is doing a series and character work is repeated each day for months and years, it can become easy to chit-chat off-camera and gossip and play pranks on each other and then jump into a scene, but for most journeyman (and journeywoman?) actors moving from job to job, it's about concentrating and getting the day's work done. It's the scene. Very little can be accomplished while chatting around the crafts-services table - even with good coffee. My only modification to that statement would be that you sometimes run lines off camera. You sometimes ask the other actor in a scene if there's anything else they need, if you can help them in some way. But that's it and I don't remember any conversations of that nature with Kelly. Sorry I don't have more. She was very professional and did the job. Q: Any other interesting stories or favorite memories from making Weird Science that you can share with us and let us in on? Britt: This memory does not qualify as my favorite, but maybe it would work for most amusing. We first shot in Chicago, where we did exteriors. I did the scene in the car - "Gary, who's Gary?" - and I think there was a scene at a mall and some exteriors at the house. But my only scene in Chicago was that scene in the car on a street as Gary drives by. Anyway, time came to fly back to L.A and I sat in the hotel lobby waiting for, ahem, the younger members of the cast (who shall remain nameless) to show up for the car to the airport. They were late and then they were later. So late that when we finally got to the airport I had to run to catch the flight. Today I weigh a very svelte 215 pounds but in those days I weighed considerably more and did not appreciate having to run through O'Hare to catch the plane. No TSA in those days mercifully. To say that I was out of breath when I finally made it to my seat on the plane would be an understatement. Okay, they will now be no longer nameless. It was Bill Paxton and Michael (Hall) who were late and required my running to catch the plane. I have no idea why they were late to the lobby. I don't know why they overslept. I wouldn't want to imply that they had been having too much fun or anything like that the night before. My hope is that they had been up late studying the Gideon Bible and got to bed late, after a prayer. That is my hope. 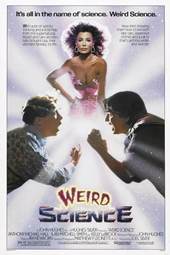 Q: What were your feelings about Weird Science when the film was released in 1985? 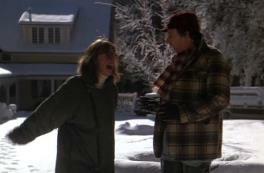 Britt: Again, I wish I could make this more special. But for a journeyman actor, it's always about the next job. I was never very good at watching how a film I had done was doing at the box office. I was just looking for more work and going through the audition process again. And again. Looking back now, I hope Leach can appreciate how great he was in that role as well as the one we will talk about next. 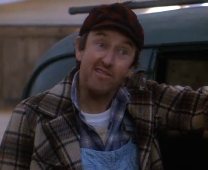 Q: You appeared in another Hughes film with 1988's The Great Outdoors (which was directed by Howard Deutch though). How did the role of "Reg" come to you? Did it have anything to do with your previous work with Hughes? Britt: I enjoy answering these questions because I like giving a touch of reality to the sparkle and glamour of showbiz and to whatever minimal fame (probably the wrong word) I might have. Sometime after Weird Science I was on a publicity tour for another film I did, Baby Boom. Before leaving for that tour, I had read for The Great Outdoors. Howard Deutch and I had met in Milton Katselas's acting class (a master class if you must know) and he called me in for the interview for the part of "Reg". In those ancient days, they had the process of videoing the interview. So I was reading with the casting director and doing my only big scene at the bar, the lightning scene, and I broke her up, as we say in showbiz. She was laughing so hard at me that she couldn't get through the scene. So Howie Deutch took over and read the other lines (Candy's and Aykroyd's). My guess is that the video was for John Hughes. But before leaving for the Baby Boom publicity tour, I had heard nothing about my reading for The Great Outdoors. I probably guessed that I hadn't gotten the part. The Baby Boom tour went to Houston, Miami, Atlanta. I was in Atlanta and had done a TV interview about Baby Boom and got a call from my agent. "You got the part in The Great Outdoors," she said. Wonderful. "And you're going to be needed at Bass Lake near Fresno the day after tomorrow to start shooting. And it's okay with the publicity tour for Baby Boom. I checked." Okay, the next stop was a TV station in North Carolina and then fly back to L.A. and then on to Fresno. When I reached wherever it was in North Carolina, I learned about the offer (the money) and it wasn't bad, more than I'd ever gotten before, so I was ready to go. 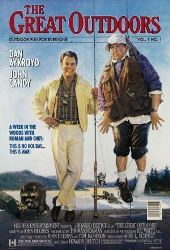 And to cut it all very short, I went to Bass Lake near Fresno, California and did the part with dear John Candy and Dan Aykroyd. Okay, but there's something else. Why so long between the interview for the part and getting that call two days before I was to start shooting? Dear friends, I think the answer was that they were attempting to get a bigger name for the part. A cameo. And who the hell knows who that might have been? I don't. But it was a damn long time after the initial interview and damned short time before I had to start shooting. But that's showbiz. And more people remember me from that part than anything else I ever did including Weird Science. So I don't care how it happened. About my research for the part? I do nervous very well. Q: The bar scene where you get introduced and we learn about your character getting struck by lightning is just pure comedy to me (not that getting struck by lightning is all that funny, but the way it was presented). What can you tell us about that scene? Britt: Howie Deutch is a wonderful guy and a fine director. He, like John Hughes, allows actors to work. Very little direction. So we shot a bunch of film. I did my lightning thing over and over with dear John Candy and Dan Aykroyd. You sit down with a star when you're a journeyman actor and there are nerves working even though you're both just actors. So in the first few rehearsals I was blowing my lines, forgetting. "Damn, John, I'm sorry. I'll get it. Don't worry." And John Candy said, "Don't worry about it. I'll work off whatever you give me." Or words to that effect. Hand to my shoulder. A dear, dear man. There were only two camera angles that I can remember, and we shot a bunch of film. But it worked, and I finally remembered my words. To include the number of times the character had been hit in the head. 66. I still remember. The Great Outdoors was released in June of 1988. The scene with Leach as "Reg" only lasts a couple of minutes, but is quite hilarious and one of my favorites from the entire film. "You'll never meet a guy more tuned in to the barometric pressure than Reg. Yeah. You see him running like hell for home, head for cover." Q: As mentioned, you worked with John Candy and Dan Aykroyd, both comedy geniuses. Anything else you can tell us about your time working with each of them? Britt: Other than what I already mentioned in the answer above, both were absolute pros. John's death, too young, was very sad to me. Dear man. Q: Do you still get recognized for your role in Weird Science or The Great Outdoors? If so, which one more and how often or are there other roles you get recognized for most often? Britt: I do remember being in a copying place in Studio City, California where I lived and seeing a man I'd never seen before who asked me, "How many times in the head?" That's all he said. Does that suggest anything? I don't know. Usually recognition is not specified. You get a look. It's that look that I usually interpret as they remember me from something but can't quite place it. And I'll get: "I've enjoyed your work." Just a look and a nice comment. I do my best to be grateful to either. Q: Horror fans may remember you from your role in 1984's Silent Night, Deadly Night as the toy store manager. Anything worth sharing about that notorious film which has gone on to become sort of a cult favorite? 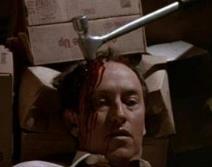 Britt: In Silent Night, Deadly Night, my character died with an ax stuck in his head. Off-set anecdote (could be boring but maybe not): I was active in what was called Animal Rights in those days and was in a demonstration at UCLA against vivisection. I was and am an antivivisectionist. So a bunch of us animal activists were chanting whatever we were chanting about animals and across from us was a line of sheriff's deputies or campus cops, billy clubs at the ready. So when the demo was over and we all were heading home, a cop came over to me. "Oh, hell, here it comes," I said. "I'm dead now. Maybe I gave him a look during the demo. Maybe he's going to question my attitude." Instead, and to my great relief, he said, "How'd they get that ax to stick in your head?" Q: As you mentioned earlier, you were in 1987's Baby Boom which starred Diane Keaton. What can you tell us about that role and working with Keaton in Baby Boom? 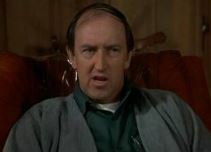 Britt: So Baby Boom came after Weird Science and before The Great Outdoors. Baby Boom seems to be as popular with fans as The Great Outdoors. I've never made a study of it, but that's my impression. It was shot in Manchester, Vermont, and the director was Charles Shyer, who had been one of my champions, had seen me in a play I did in L.A. and had recommended me to Jack Nicholson for Goin' South , which I shot in Durango, Mexico. In Baby Boom, I played the plumber who gave the Diane Keaton character the bad news about (what else?) her plumbing. Frozen pipes in her house and a well that had run dry. But this plumber - Verne Boone by name - was also a sax player and had his own little orchestra. So in working on the character, I made him a man who thought of himself as a sax player first who happened to make his living as a plumber. Sort of like actors in Hollywood who make their living as waiters. Verne and his orchestra are seen and heard later in the film at the Harvest Festival dance. Diane Keaton of course is a pro. And once again, as it had been with John Candy in The Great Outdoors, I was a bit nervous on my first day shooting with her and blew a few takes. Diane was gracious about it (even though she also had a baby resting on her hip while I was attempting to remember my lines). I sang in the film. Certainly didn't play the sax, but I was able to carry a tune, the tune being "Moonlight In Vermont." I recorded it at MGM in Culver City. The director of the orchestra rehearsed with me before the orchestra came in. "That's great," he said. "Just pretend like you're in the shower." And I did and had a great time singing. Q: Any other memorable moments from making Baby Boom? Britt: I was never a temperamental actor. Journeyman actors can't afford to be, but I remember that in doing Baby Boom in the snow of Vermont, I had a moment of snippiness that I probably took out on the wardrobe person or third assistant director. Those good people catch a lot from actors for some reason. Anyway, I had to wear about four layers of clothing for the scene at the well, including hip boots. And I had dressed and was called to the set. I should mention here that I was dressing in a room the size of a walk-in closet in an apartment building, not a walk-in in Beverly Hills or Bel Air, but a room where it was literally difficult to turn around. And I was fat, 240 pounds at the time maybe. Anyway, I have been called to the set and I'm on my way out of the door and I glance toward what is laughingly called the bed, where my wardrobe had been laid out, and discovered a layer. A Shirt, an undershirt, or something. No way that I could leave it off of my fat body, all the layers had been established in a previous take. So I had to tell the nervous wardrobe person or third assistant director that they'd just have to wait, I'd missed a layer. The temperament came from realizing that once again I was dressing in a closet. While the babies of Baby Boom (twins, of course, who played one child) had a damned motor home big enough to bowl in. "Tell them they'll have to wait!" But the scene at the well went... well and Diane Keaton was a pleasure to work with. Pro, all the way. It became a very popular film. 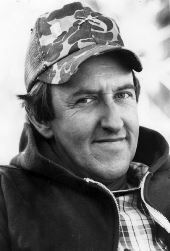 In addition to his many movie roles, Leach had many roles on television as well appearing in some of the most popular television shows of the time. Here are just some of the shows that he appeared on during the '80s: M*A*S*H, One Day at a Time, Dallas, Hill Street Blues, Three's Company, Newhart, The Dukes of Hazzard, Fame, St. Elsewhere and Tales from the Crypt. Q: Anything memorable that you can share with us about your experiences on any of the popular '80s television shows you appeared on? Britt: A blur for most of those credits. Can't remember most. Can't even see the blur. But Howard Deutch directed the Tales from the Crypt that I did ["Only Sin Deep" 1989]. (Here I should also mention that he directed Article 99 , which I was also in but was sliced out of in editing. Much to my residual regret. I also enjoyed doing the film with Howie - and he apologized, but it wasn't his fault. Too long, the studio said.) On Tales from the Crypt, it was a weird and serious role, and it might have been a bit too weird and serious for old comedic me. I don't remember being particularly satisfied with what I did. I think I did three different episodes of Three's Company. Lots of fun. John Ritter was another dear man, left us too soon. Three different parts on Three's Company. I do remember that in one I lived with a parrot named Hortense. Oh, God. The things you remember. Q: You seemed to have retired from acting in the early '90s. Why did you decide to get out of acting at that point? What have you been doing since then and what else has Britt Leach been up to more recently? Britt: If I went into the business of why I got out of acting, I'd have to get into the business of why I got into acting. And that's something I am working on now in my writing. I have three websites that are up and running that contain some of my writing. Okay four. My wife, Catherine, and I left Los Angeles and moved to the mountains to the north. While there, we started a newspaper, which became a magazine. Country Connections by name [an award-winning bi-monthly magazine which covered environmental and progressive social issues]. It has an archive website. I started writing seriously for it. After we had to shut it for lack of funds, etc., I started writing for websites which I designed and nurtured. They are Veritas Any Day Now, Impertinent Information and I'm now archiving my writing on BrittLeach.com. I also have a piece coming out in the October issue (16.1) of River Teeth Journal and I'm told that a piece I've written will be in North of 40. In other biographical news, I have a cat named Alex and a long-suffering wife named Catherine who is a terrific photographer and my love... CRLeach.com. Thanks for listening. I am so pleased that Britt was able to take some time to answer some questions so I could share them with you here. 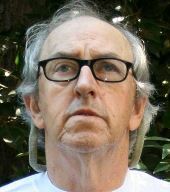 You can keep up with his writings at all of the sites mentioned above including BrittLeach.com. I want to take this occasion to again thank Britt Leach for his contributions to '80s pop culture especially through Weird Science and The Great Outdoors and, even more, for going back to the '80s with us here for a little while as well. 66 times!